Matt Cutter, owner and founder of Upslope Brewing in Boulder, Colorado started the evening by saying that he had never seen anything like this before, “a sea of women drinking craft beer!” And he was right. The room was filled, yet another sold out night of beer lovin’ women all sipping on cans of the evenings first offering, the Craft Lager. Instead of food accompanying the Craft Lager, Cutter shared the tale of how Upslope came to be exactly four years ago . . .
Cutter had the dream of opening a brewery for many years, tried once, but life got in the way. In 2008, he revisited his dream, put a business plan together and started shopping for brewers. Through six degrees of separation, and a little serendipity, Cutter met his brewer, Danny, an Argentinean citizen formerly of Beagle Brewing in Tierra del Fuego, Argentina. Long story short, Danny had fallen in love with a woman from Aurora shortly before he and Cutter crossed paths and ended up in Colorado at exactly the right moment. In April 2008, a lease was signed on Upslope’s current location and five months later the equipment arrived for brewing. Danny had returned to Colorado, this time for good, and started test batches. Matt and Danny had the lofty goal of producing the first round of beer for liquor stores by Thanksgiving of 2008. Using the delicious Pale Ale as their first beer (the IPA was only a few weeks behind) they received the empty cans from the manufacturer on the Saturday before Thanksgiving and delivered the beer to the shelves two days later . . . a true success. The Craft Lager took Danny 14 months to develop. It’s accurately described as “bright-fresh-easy.” This is a great porch-pounder at only 4.8% ABV, using Czech Saaz hops. And 1% of sales from this beer support Colorado rivers through Colorado Trout Unlimited. Next, we sampled their flagship Pale Ale paired with homemade Pale Ale bread and honey butter, a recipe created by Cutter’s wife. We learned that both the Pale Ale and the IPA use Patagonian Cascade hops, a new varietal for me and others in the room. Cutter explained their interest in these hops arose during the hop crisis of 2007. During that fall, no one could get hops because farmers were converting hop fields to corn for ethanol, and over $4 million in hops perished in a Yakima Valley barn fire that same year. With that, Cutter asked Danny where he got his hops from at his former brewery in Argentina and if they could secure hops from those same growers. Danny reached out to the “hippie operation” in the Tierra del Fuego region. After five months and countless conversations, the hops arrived from way down south. The Patagonia grown Cascades were described as spicier and earthier compared to the Northwest Cascades that are generally more piney and citrusy. The third beer of the night was the malty and roasted Brown Ale, paired with a cheese plate. At 6.7% ABV this is a really nice dark beer with English hops and brown sugar. Cutter described this beer as an “English style that has been Americanized.” Call me an American, but I certainly enjoyed this course. The IPA accompanied with an ancho chile steak followed, and by now the room was buzzing. 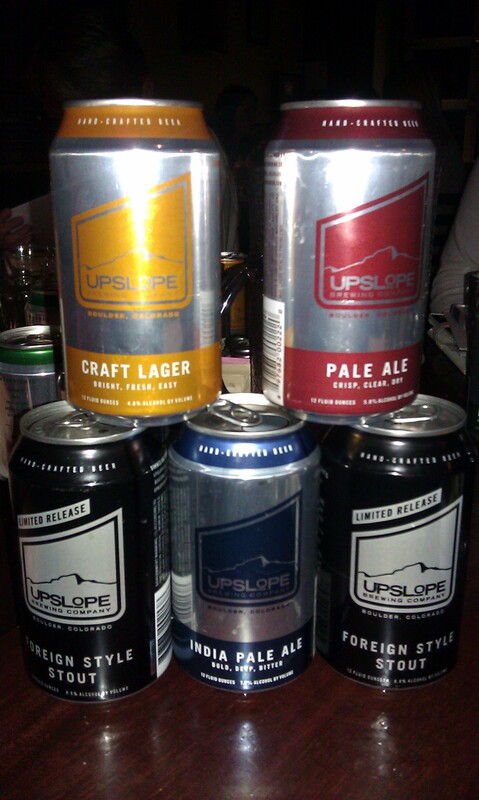 I may not have mentioned it before, but the very generous Upslope crew provided each of us with a full can of every beer we tasted. You might imagine that at this point the decibel level in a crowd of roughly 50 women was pretty high. In any case, I overcame the noise and savored my favorite style. The Upslope IPA is a 65 IBU-7.2% ABV bold and slightly malty IPA that’s a little darker than most IPAs you come across. Rounding out the evening was the Foreign Style Stout paired with a deliciously decadent chocolate bread pudding that had been doused in the Stout. I have been hearing great things about this beer through the grapevine over the past few months, but had yet to try it. 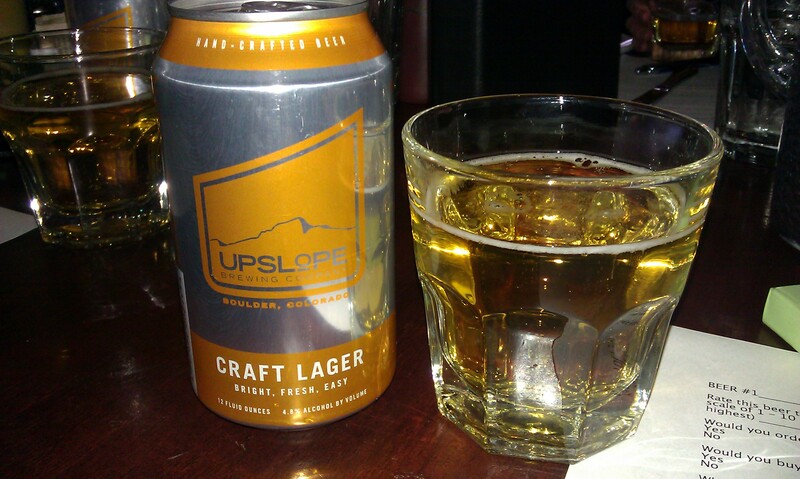 I was excited that Upslope was offering it to the Crafty Ladies. And again, Cutter shared some great history with us, explaining that foreign stouts were originally made by the Irish for export to tropical regions because of their low ABV drinkability. Admittedly, I had put a few beers away by this point in the evening, but my palette stayed strong. I really liked this final beer selection. It was very easy to drink and provided a nice roasted barley flavor, using five different malts and Irish Ale yeast. As always, thank you to Highland Tap and Burger for hosting this event, and thank you to Matt Cutter and the crew from Upslope for sharing delicious beer and great stories. This entry was posted in Craft Beer Adventures, Tasting Highlights: Breweries, Women and Beer and tagged Beagle Brewing, Highland Tap and Burger, Hop Crisis 2007, Patagonia Cascade Hops, Upslope Brewing. Sounds like a great time. I love the atmosphere at Upslope. Great entry about a great evening. Glad I was able to join in on the Upslope fun!